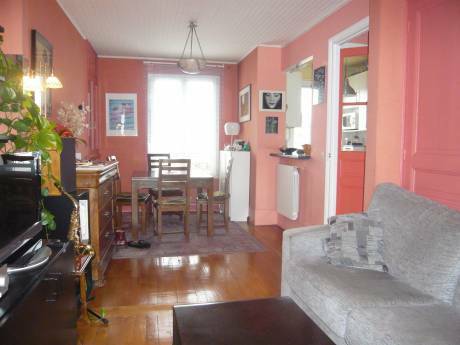 We offer a large and beautiful apartment in Meudon very close to Paris. We have four bedrooms, three with one single bed , one with a double bed . There is one living room with a sofa, a dining room , and a small kitchen but all the family can eat.We have two bathroom, one with a bath and one with a shower. 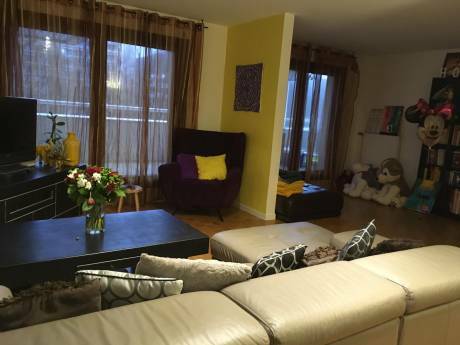 It's a big apartment with wooden floor and the windows open to the garden. We have an on-site concierge, and a house keeper. The appartement is in a big park with sand pit and places to play for the children.You can put the sunchairs in the garden and enjoy the quietness after having visited Paris. We have a computer, a very large plasma TV,DVD,playstation, WII, and a lot of toys for children. We have two bicycles in the garage. We can do non simultaneous exchange during school holidays in october, february ,april july and August because we often go to the south of France. We are Marie-Alix and Pierre, a married couple with three teenagers ,two girls of 22 and 20 and a boy of 17 very well behaved. We are both professionals (Pierre has his own business (event agency) and I am a secretary for a catholic association. We all love traveling, and try to visit foreign countries as often as we can. We have done a lot of exchanges before and we loved it, each time we welcome of guests with french specialities. We like to visit museums and monuments but also winter and summer sports. We have a very friendly cat but she can go to neighboroughs during the holidays.